Guys. Look at that picture. I know the vegetable looks kind of weird - that's broccoflower, which is a hybrid cross between broccoli and cauliflower (clever, huh?). 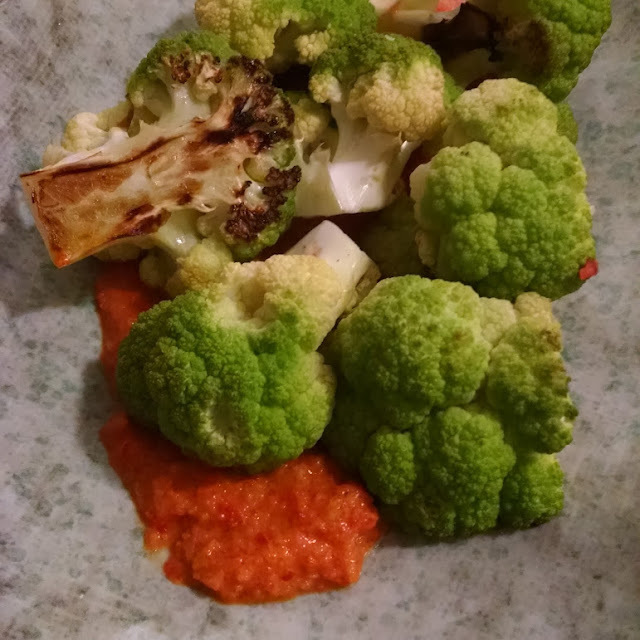 But don't focus on the genetically mutated cross-bred vegetable, Focus on what's underneath the broccoflower - the romesco sauce. I wanted to eat that sauce with a spoon, in great big mouthfuls. But I refrained cause I'm a lady. The sauce pairs well with chicken, beef and basically any sort of roasted vegetable. I roasted more cauliflower afterwards and it also tasted great! Set oven to broil and arrange the bell peppers (cut side down), the tomato (cut side up) and garlic on a baking sheet. Broil until the garlic turns a golden brown, about 3-5 minutes. Turn garlic and broil a couple minutes more. Transfer garlic to a bowl and cover with plastic wrap. Continue to broil peppers and tomatoes until the peppers are charred and blackened, about another 5-10 minutes. Remove to the same bowl as the garlic, cover with plastic wrap and set aside to cool. In a dry pan over medium heat, toast the almonds. Once they are a light golden brown, transfer to a food processor and pulse until they are broken up (not too fine). Peel the skins off the peppers and tomatoes, being careful as they are hot. The skins should come off fairly easily, but just try to get most of it. Combine the rest of the ingredients into the food processor with the almonds. Puree until almost smooth. Taste and adjust seasonings, adding more vinegar, honey or salt as needed. Eat with roasted veggies! What do you do when you have a ton of leftover lobster carcasses? If your answer is "throw them away, of course - the delicious lobster meat is gone and that's trash" then that answer is wrong! Take the shells and make a delicious, rich lobster stock. 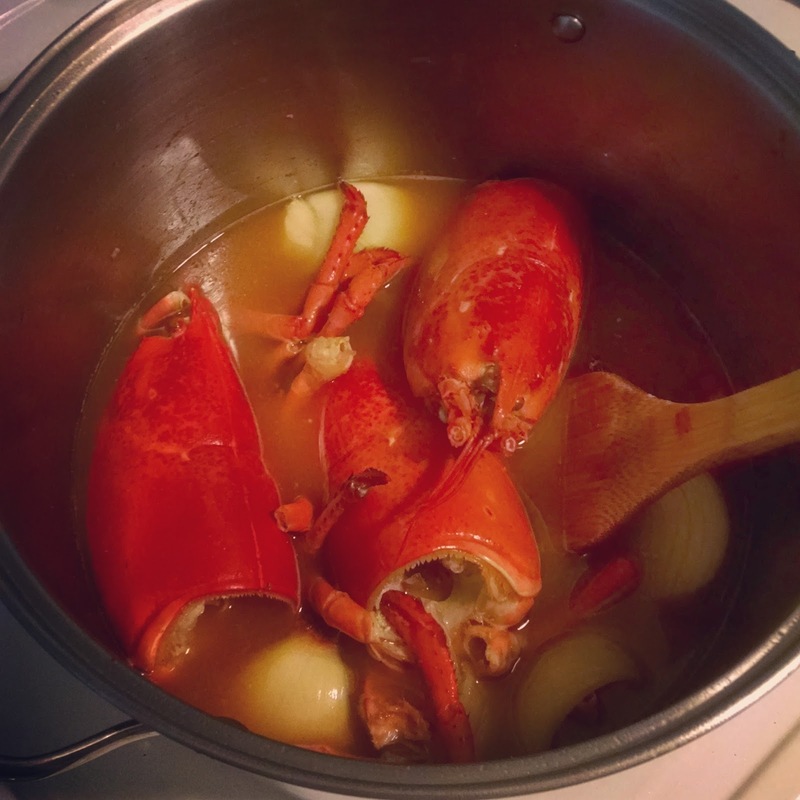 The stock is very versatile - use it as a base for a lobster bisque, seafood soups, chowders, seafood pot pies, etc. After you eat the lobsters, scoop out the thick roe on the inside and save that for another use. My mom is going to make porridge with it tonight, which is also very exciting - but beware of the cholesterol levels, if that's an issue for you. Also, remove the gills and any innards. Simmering the stock made my apartment smell amazing and seafood-y (is that a word?). I think the first thing I'm going to make is lobster miso soup, much like the kind made from the heads of sweet shrimp at Japanese restaurants (amaebi). Just add some miso and a few cubes of tofu and I'll be good to go! Heat oil in large stockpot over medium heat. When the oil is hot (but not smoking), add lobster shells. Stir often with a wooden spoon until they are browned, about 15 minutes. The longer you deepen the color, the more flavorful the stock will be. Add onion, carrot, tomato paste (or tomatoes), mirin and wine. Cook until the wine has evaporated by half. Add water and bring stock to a simmer. Continue to simmer for an hour, uncovered. Strain stock and keep at room temperature for up to a day, or refrigerate for a week. Freeze for up to three months.